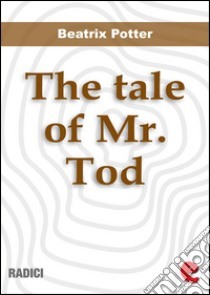 Tommy Brock, a badger, kidnaps the sons of Benjamin Bunny and disappears hiding in one of Mr. Tod's houses. Mr. Tod, came home and discovered the invasion starts a fight with Tommy. Benjamin Bunny and Peter Rabbit take advantage of the confusion to rescue the young bunnies. Book illustrated with beautiful Potter's watercolors.